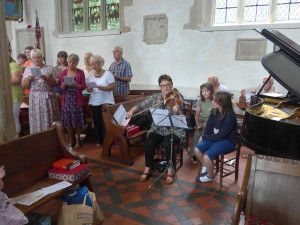 Music plays an important role in many aspects of church life, both in supporting services and in the wider life of the church. Scroll down this page for information about our active Choir, Music Group and Bell Ringers at St Lawrence. For details of concerts and musical performances, held throughout the year at St Lawrence, please check our Calendar listings. 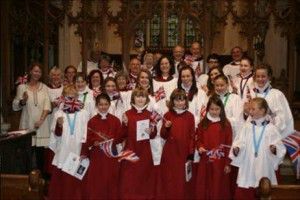 The Choir at St Lawrence is a mixed four-part choir who, accompanied by the organ, sing regularly at Sunday morning communion services and Choral Evensong, as well as at special services throughout the year such as a candlelit Advent Carol Service. They also support the wider South Cotswolds Team Ministry in special services across the Team parishes. Please visit the Choir website for detailed information about the Choir and forthcoming choral events. A history of the organ at St Lawrence can be found here. The Music Group, made up of instrumentalists and singers from the congregation, supports worship at our monthly Informal Service (Inspire), at our monthly all age Together@10 service and at all age Christmas services. We encourage musicians of any level to join this informal group. For more information about getting involved, please contact the Parish Office. The bells are rung each Sunday at 9:15am for the morning service, as well as for other special services, including weddings. Practices are on Friday evenings from 7:45-9:00pm. For further details or to arrange a visit for a taster session please contact Anny Crawford at towercaptain@lechladebellringers.co.uk.